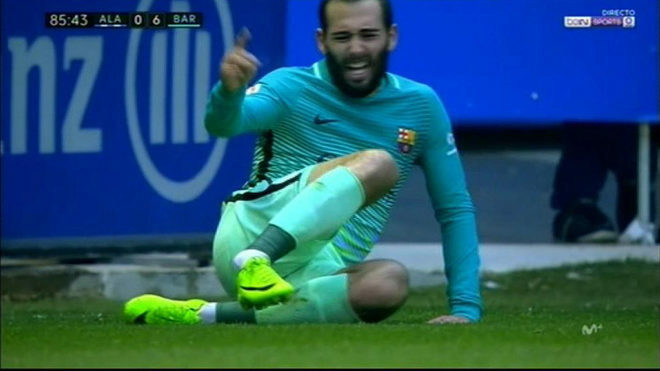 It has taken Aleix Vidal a great deal of time to become integrated into the Barcelona starting XI, and although it looked like he was gaining confidence, the Spaniard had to be stretchered off against Alaves after a nasty collision. For a long time, the former Almeria and Sevilla man has been a forgotten commodity, often left out of matchday squads altogether, and yet now he looks to be among the better options down the right flank. Vidal added to his ever-growing lore in Saturday’s 6-0 thrashing of Alaves as he assisted Luis Suarez for the first goal of the match, sending an accurate, well-placed pass into the box, his fifth assist of the season in 11 matches played. The 27-year-old defender also has two goals to his name this campaign, scoring against Las Palmas and in the last league match Athletic Club. He nearly added to that tally at Estadio Mendizorroza but failed to find the back of the net after getting into a promising position. The right-back slot has been a long-debated one, but the debate looked to be over, especially after Sergi Roberto’s inconsistencies in that position. However, Vidal will need to regain his confidence after he recovers from the ankle injury which could be a significant lay-off. Once he does, the starting spot could be his.